The Leafcocoon soft eco coffin – what is it? 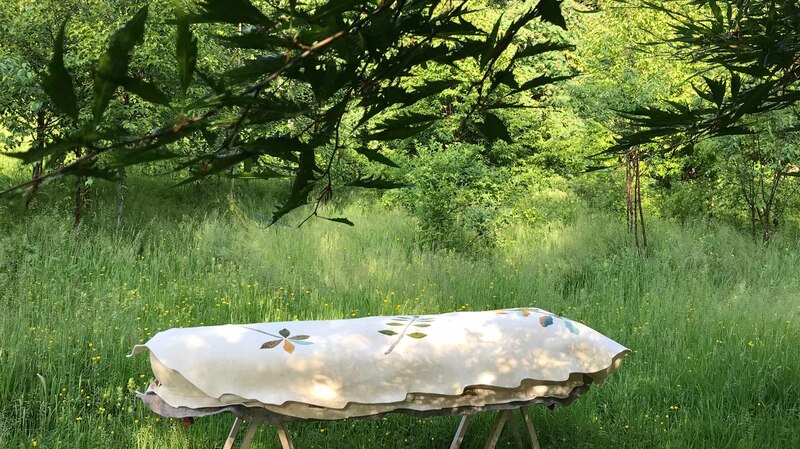 It is a fully biodegradable, plastic free and complete alternative to conventional coffins, designed for an environmentally friendly traditional, meadow or woodland burial. It is leaf-shaped, reflecting our connection with nature, and has a smooth outline because of the many layers of thick felt. How is it made and used? Each Leafcocoon is individually hand-made on Dartmoor from entirely natural and compostable materials, using wood and 100% pure organic wool felt from local sources. We also use some recycled materials to further reduce our carbon footprint. The Leafcocoon consists of a base with carrying handles, a shroud and an optional plain or simple decorated leaf shaped cover. (See below for details.) The Leafcocoon base is made of a sturdy wooden frame, encased in felt, padded with recycled materials and carefully lined with waterproof paper. Six strong handles take the weight. The carrying handles are an important detail. They are made of wood, recycled strapping material and covered in soft felt as carrying a loved-one to the grave is a tender final act: the handle must feel nice! Even if the family/friends do not participate in this, the professionals will appreciate this detail. There are extra straps underneath for pulling the coffin in or out of a vehicle. The papoose-like Felt shroud is strapped to the base with fastening ties to ensure stability and safety. The plain woollen shroud has enclosures for head and feet and is double wrapped from the sides. It is also available separately for use in other coffins or with biers as there is no integral wood structure. Different sizes are kept in stock which can be prepared, finished and delivered in 2 to 5 working days. Bespoke versions can be made to order if a specific size/weight bearing is required. Extra Large for heavier weight bearing or sizes under 5′ – made to order – please contact Yuli. You can order a Leafcocoon with or without a cover. Leafcocoon Covers Wool felt Leafcocoon coffin covers are optional and available either plain or decorated with a simple leaf design. A plain leaf-shaped cover shelters the shroud and gives a smooth outline. A decorated cover with a needle-felted design adds a touch of colour to the cream base – natural dyes used, of course – and based on native leaf themes. The cover can easily be removed at the graveside and kept, if desired, as a keepsake. A grey version is available to order. Please email or ring me if you would like to discuss a bespoke design (extra charges apply). The Shroudcocoon – a simple unlined felt cocoon suitable for storage and posting. This is an un-lined cocoon of felt, with 6 strong handles. Underneath, there are 3 wooden cross pieces sewn in, and sleeves to take two long wood planks. This gives stability. The latter are not provided, so there’s an element of DIY, but any wood merchant can cut to the required measurements, and detailed instructions are included. Waterproof liner not provided. I designed the Shroudcocoon as I have consistently been asked for something simple, and something that can be stored or posted abroad. This can be rolled up and stored in a vacuum bag (as can the simple shroud above). A cover, with or without decoration can also be added.